The Annual J. Reuben Clark Law Society Fireside is scheduled for January 31, 2014, at 6 p.m. in the LDS Conference Center Little Theater, and there will be a reception following the Fireside on the plaza level. Tickets are not needed to attend the live broadcast. 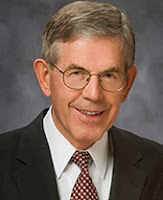 This year's featured speaker is Elder Bruce C. Hafen, Emeritus General Authority of the Church of Jesus Christ of Latter-day Saints and one of the founders of the J. Reuben Clark Law Society. More information will follow regarding how to watch the broadcast locally.